The real power of VRT files comes into play when you want create virtual representations of features as well. In this case, you can virtually tile together many individual layers as one. At the present time you cannot do this with a single command line but it only takes adding two simple lines to the VRT XML file to make it start working. Here we want to create a virtual vector layer from all the files containing lines in the ne/10m_cultural folder. If added to QGIS at this point, it will merely present a list of four layers to select to load. This is not what we want. So next we edit the resulting all_lines.vrt file and add a line that tells GDAL/OGR that the contents are to be presented as a unioned layer with a given name (i.e. “UnionedLines”). Now loading it into QGIS automatically loads it as a single layer but, behind the scenes, it is a virtual representation of all four source layers. 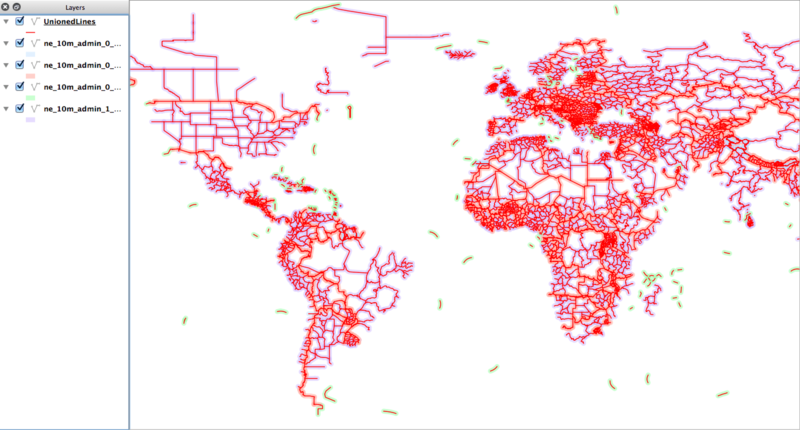 On the map in Figure 5.8 the unionedLines layer is drawn on top using red lines, whereas all the source files (that I manually loaded) are shown with a light shading. This shows that the new virtual layer covers all the source layer features.